Apex Turf is locally owned and operated by Michael Cram of Clifton Park and Beth Horrigan of Hudson Falls. Michael started his industry experience in 1988 as an applicator and customer service representative for a national lawn care firm. He then spent many years providing both guidance and turf care supplies to local lawn and landscape contractors while managing a local branch of a national landscape supply firm. Beth earned a Bachelors of Science in horticulture from Cornell University. She first worked on a local golf course as an assistant superintendent, and then superintendent, for a total of 12 years before taking a position with a national landscape supply firm, working with Mike to provide education and supplies to local contractors. Eric Sagendorf, our Warehouse Manager/Sales and Service Representative, has almost 20 years of industry experience, both on the lawns and behind the sales counter. Nineteen years ago he helped his dad start and grow a lawn care business here in the capital district. In 2005 Eric went to work for a national landscape supply firm. He spent the next 12 years there providing both education and turf care supplies to local landscapers. Knowledgeable Sales and Service Representative, Sara Halloran, has a Bachelors of Technology in Plant Science from SUNY Cobleskill. While a student, she completed two internships, one at the National Arboretum in Washington DC. Sara has been with Apex Turf for three years and is ready to share her knowledge and answer questions. Alicia Lloyd is the extra friendly voice on the other end of the line when you call our office. Alicia's background is in the restaurant industry so her customer service skills are top notch. She can answer lots of questions about our program, services, and scheduling. Anything she's not able to help with, she's more than happy to connect you to the person who can. In the field, we have a team of conscientious, hard working and experienced applicators that have undergone state mandated training as well as extensive in-house training. With this combination of backgrounds and experience we are confident we can face any challenge your lawn presents. We know turf...both the problems and the solutions! The mission of Apex Turf is to provide professional quality lawn fertility services with the goal of exceeding your expectations. With years of experience, industry knowledge, and progressive thinking, Apex Turf will strive to make your lawn the envy of the neighborhood! 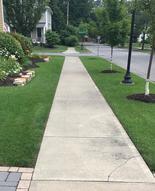 Apex Turf is a local, professional lawn care company specializing in timely fertilization, pest, and weed control services for both residential and small commercial lawns.